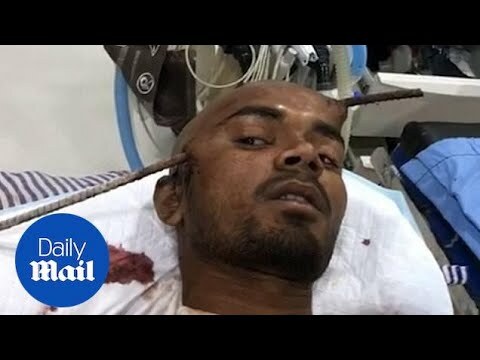 WARNING GRAPHIC CONTENT: Construction worker Sanjay Bahe, 21, from Balaghat, central India, was doing some repair work at a construction site when he fell down a well and the rod pierced straight through his head. The young man was rushed to B.J. Hospital in nearby Gondia, after the iron rod pierced from the right temporal region of his brain to the left frontal region (main and inset left). A team of neurosurgeons, lead by Dr Pramod Giri, performed a gruelling 90-minute operation (inset right) to successfully remove the rod, with hardly any bleeding or injury to the surrounding area.